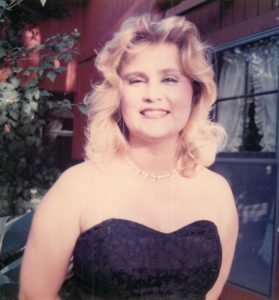 Mrs. Donna Marie Propri, 58, passed away April 11, 2018 in Houston, TX. Mrs. Propri was born on May 22, 1959 in Columbia, MS. She grew up in Pearland, TX, graduated from Pearland High School and attended Providential Baptist Church. Mrs. Propri is preceded in death by her parents, Herman and Maggie Guice and brother, Gerry Guice. Donna leaves behind her husband of 36 years, Jerry Propri; step-daughters: Donna J. Propri and Barbra Batten; step-sons: Benedict “Jerry” Propri Jr. and Frank Propri; sister, Connie Graves: brother, Jeff Guice; sister-in-law, Kathryn Guice; nieces: Jessica Guice and Savannah Guice; nephew, Mason Davenport. Family will be accepting guests Monday, April 16, 2018 from 5-8 p.m. at Crowder Funeral Home in Pearland. Funeral service will be held Tuesday, April 17, 2018 at 4p.m. in the chapel of Crowder Funeral Home. She suffered much so I’m sure her reward will be much. Her husband was always by her side.